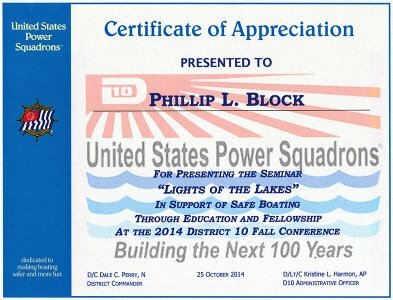 On October 25, 2014, Lights of the Lakes was presented to an appreciative audience of 55 boaters at the USPS District 10 Fall Conference. The venue was the Landmark Resort in Door County, Wisconsin. Over the many years I have been doing this show, this is the first time I ever received a Certificate of Appreciation!